There are no professional guidelines (yet) which define what it means to be a Performance Measurement Leader – not like there are for Accountants, Project Managers, Finance Officers and Engineers. So there’s little wonder that there are so many talented and capable performance measurement practitioners out there who are underselling themselves. Q1: How much of your time do you spend – or should you spend – on performance measurement activities? Performance Measurement Leaders routinely spend at least 40% of their work time devoted to a broad range of performance measurement activities, including the selection of measures aligned to strategy, collection and collation of performance data, analysis and reporting of performance, interpreting and using performance measures to improve performance. Q2: Have you had some exposure to structured performance measurement methodologies? 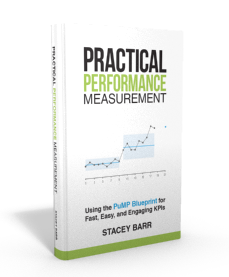 Performance Measurement Leaders will have at least a rudimentary working knowledge of one or more formally structured and tested performance measurement approaches, like PuMP. Q3: Can you design and implement simple business projects? Performance Measurement Leaders need to have reasonable project management skills and experience, because managing a performance measurement implementation, and a corporate performance management system, needs planning of tasks, milestones and resources. Q4: Are you confident with your presentation and facilitation skills? Performance Measurement Leaders need to feel confident with presenting to groups, and also managing group interactions and dynamics in workshop settings, because they run a lot of meetings with Measures Teams to plan and implement various aspects of the performance measurement system. Q5: Can you speak about performance measurement in a way that engages your colleagues? Performance Measurement Leaders work with internal client teams to design and implement the organisation’s performance measurement system – they don’t do it on their own! So they must be able to engage their colleagues to commit to implementing the performance measurement process with them. Q6: Do you feel passionate about performance measurement? Performance Measurement Leaders have a passion for performance measurement and the profound transformation it can effect for an organisation. They also have a passion for learning and refining their capability, as a significant component of their career path. Just like any quiz, the value is not in right or wrong answers. The value comes from considering the questions and seeing what comes up for you. 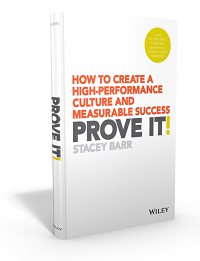 So, how do you feel NOW about having what it takes to be a performance leader, or Performance Measurement Leaders? Good article as usual. I changed jobs about a year ago and the main issue I need to tackle is poorly written objectives coupled with unrelated KPIs. Because of this, there is little interest in performance measures. Wish me luck! Although, luck is not really what you need, as you know. 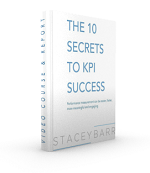 If you can highlight that the reason for the unrelated and not useful KPIs is the way the objectives are written, and you can show examples of well written objectives with meaningful KPIs, you’ll have more leverage than luck. It’s easier to see how we can improve our performance measures when we understand that we can change our approach to choosing them.